Mexican flag above the World Social Fourm Tematico at Zocalo in Mexico City were the different strand of the climate movements in Mexico came together in May 2010. The Espacio Mexicano frente a la Crisis Climática (ES-MEX) and the Diálogo Climático, Encuentro de las voces de los pueblos y los movimientos frente a la crisis climática, join together civil society and social movement actors interested in exchanging information, discussing the main topics of the climate crisis, promoting political mobilization and bringing together educational actions and others in order to spread information in face of the next (16th) Conference of the Parties of the United Nations Framework Convention on Climate Change (COP 16), which will take place between 29th November – 10th December 2010 in Cancún, Mexico. It is a pluralistic and open space, in which different opinions, strategies and political cultures are expressed, and at the same time it is organized based on a clear political stance for common action. The Diálogo Climático and ES-MEX consider the creation of consensus as an open and honest process of dialogue and discussion, recognizing that there exist different initiatives and groups acting in the COP 16 process and afterwards both at a national and at an international level. The Diálogo Climático and ES-MEX are considered to be part of the Mexican social movement and therefore we invite other national and international initiatives to an open dialogue in order to establish the agreements needed to unify the national and international civil society actions. Thus we have called for the Diálogo Climático, Encuentro de las voces de los pueblos y los movimientos frente a la crisis climática, with the aim to create a platform of both the national and international civil society actors towards the COP 16, as well as of the actions organized both in Cancún and in other parts of the country and the world. The opportunity of common actions and strategies is based on a shared political position towards the main topics and actors within the global climate crisis and as well as on the will of giving a voice to the civil society, thus putting consensus in the center. Simultaneously, a debate about topics and strategies, on which different ideas and positions exist, is favored, with the aim of deepening the analysis and the exchange of ideas and information. The Diálogo Climático and ES-MEX consider climate change not only an environmental problem, but the reflection of a global crisis with multiple dimensions: economic, social, cultural and political. The main problem is an unjust and unsustainable model of production and consumption, which has caused climate change, social inequalities, poverty, exclusion, gender inequity and environmental exploitation. As citizens, we recognize that we are responsible for the environmental deterioration and the damage of the earth, and we assume that it is necessary to act as a consequence exerting our citizen rights. Nevertheless we put emphasis on the necessity to face the structural causes of the climate crisis which are to be found, as mentioned above, in the unsustainable model of production and consumption being the most responsible the highly industrialized economies , as it is already recognized in the United Nations Framework Convention on Climate Change. The disastrous failure of COP 15 and the Copenhagen “agreement” show that the governments are far from making real commitments when it comes to the reduction of emissions and to the changes needed to get to the root of the problem. Therefore it is urgent and necessary to increase the power of the people and the organized civil society in order to favour a real solution to the climate crisis. The proposal we impel is not circumscribed to actions within the ongoing international meetings, in this case COP 16, but to the creation of local and national agendas to unite the global movement for climate justice. This implies multiple and decentralized processes which include the commitment of many organizations and movements of every state and region in Mexico and from all over the world. We state that it is necessary to analyze, to understand, and to revive those civil society documents and declarations which came up in international events, in particular the agreement drawn up at Rio ’92 “For fair, democratic and sustainable cities, villages and settlements” and the Peoples’ Declaration about Climate Change, emanated from the Cochabamba Peoples Summit last April. 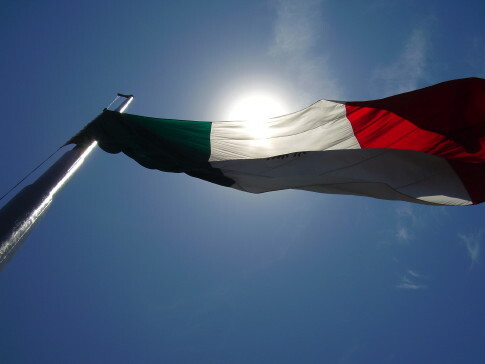 We promote the analysis of the different governmental positions and of other actors intervening in the international negotiations and debates, but we hold the view that the articulation of Mexican movements can only come from local organizations and not from international nominations. As a civil society platform we are autonomous form the government and political parties. The organizations which promote this initiative provide their links to international organizations in order to strengthen a common platform on which Mexican organizations host a space for the global movement within the preparation process towards Cancún. We declare that we promote at least five types of strategies which will make the proposals and claims of the people and the organized civil society in the COP 16 process visible. 1. Analysis and discussion in order to reach consent on positions and proposals towards the climate crisis by means of organizing seminars, round-table conferences, workshops etc. jointly between national and international organizations or through the initiatives of multiple actors, previously and during the COP 16. 2. Realization of a new session of the International Climate Justice Tribunal as an international initiative which we join and consider a privileged space for Mexican and international movements to denounce their cases. 3. Social mobilization that expresses the voice of the peoples and social movements in the streets by means of organizing protest marches, meetings, sit-ins and cultural and educational events. The organization of an unitary march in Cancún and concerted actions at other places throughout the country and the whole world at the same time, are desirable. 4. Joining together local, national and international organizations in order to generate a geographic space and an activity calendar spread unitarily which facilitates the diversity of proposals, opinions, strategies and actions. This implies a register of participants and self-organized events, in order to look for coverage of the basic logistic requests of the different national and international action initiatives. 5. Information and public spreading in the media of proposals and actions that give visibility to civil society, strengthen the educational work and the local, national and international struggles by means of writing declarations, documents, press releases, communiqués etc. We respect organizations which decide to combine advocacy and mobilization strategies (the “inside and outside” strategy) at the COP 16, but we do not accept any initiatives that declare themselves as being the sole representative of civil society. 2. Registering activities to be made in Cancún, which we suggest to be concentrated between December 6th and 10th. 3. 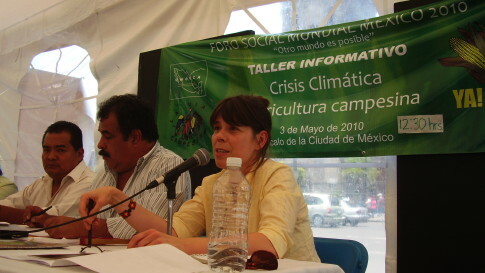 Organization of seminars, round-table conferences, workshops and meetings in order to discuss the climate crisis and participate in the construction of a local, national and international agenda about the climate crisis, which gives way to a discussion agenda and the positioning of the Mexican and the international movement in Cancún. 4. Contribute to the construction of a concerted action platform of civil society previously to and during Cancún. Mujeres Organizadas en Pie de Lucha A.C.
Mujeres por México en Chihuahua. A.C.
Centro de Apoyo para el Movimiento Popular de Occidente A.C.
During the climate summit in Copenhagen, more than 2000 people were arrested preventively and held in custody while they were trying to have their voices heard. These people along with thousands of other people from around the world were trying to set a different and more just political agenda in the climate debate. Climate Justice Action, a global network of social movements and groups, was mobilizing and calling for a protest and people’s assembly to challenge the farcical political negotiations at the COP15. They demanded just solutions to the climate crisis, solutions that do not only favor the rich western world. On the 16th of December the CJA network organized the Reclaim Power – Push for Climate Justice action, to give a voice to those people marginalized by the negotiations and most affected by climate change. This emerging climate justice movement was met with severe repression and an abuse of power from the Danish government. This was reflected in the form of massive detainment of protesters and targeting of alleged organizers of legal demonstrations. During 2009 the Danish government and the Danish police carried out an intense scare campaign in the media to demonize protesters and activists. Police were given extra legal powers and economic resources for the COP 15. This led to thousands of preventive arrests, month-long surveillance of telephones, raids of private homes and accommodations and grotesque and unnecessary detentions. Stine Gry and Tannie acted as spokespersons for CJA in the media during the whole COP period, arguing for the right to protest and against the massive police repression. They are now both being held personally responsible for the Reclaim Power – Push for Climate Justice action, and are facing charges including planning violence against police, gross vandalism, serious disturbance of public peace and order, and trespassing. Some of these charges are drawn from the Danish terror package and the penalties are strengthened by the new Danish anti-protester laws introduced just prior to the COP 15. The main evidence against Stine Gry and Tannie is that they allegedly shouted “push” from the sound truck during the demonstration on the 16th, along with thousands of other protestors. The truth is, we all shouted “push!” on the 16th, and we all pushed together for climate justice on that day. Through this trial the Danish state is trying to make two individuals responsible for a whole movement’s collective decision-making and collective protests. This is clearly an attempt to scare people from protesting and organizing politically, killing off all critical voices. It is a violation of the freedom of speech and our right to assembly. The right to protest and everyone’s right to be heard is an essential element in a democracy, even if you are speaking against the existing capitalist system. We therefore call on everyone to show solidarity with the accused on the 29th of September and make criticism of this ongoing repression visible. 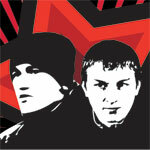 To highlight the absurdity in the charges, we encourage people to take actions using the slogan “we also shouted push!”. Post your photos www.climatecollective.org/push and send your videos of solidarity actions to the climate collective (cop15repression@climatecollective.org), and let us know any information of actions that happen. The trial dates of Stine Gry Jonassen and Tannie Nyboe are the 6th, 27th and 28th of October, but additional court days might be necessary. On the eve of the international action day for freedom for Gaskarov and Solopov 17-20th of September all main Russian environmental organizations have issued a call together for the protection of the forest near Moscow including the Khimki forest as well as making a protest against the repression. The organizations acting in unison are the Movement for Defending the Khimki forest, Greenpeace Russia, WWF Russia, Biodiversity Conservation Center, Russian Bird Conservation Union, and Socio-Ecological Union. This shows the importance given by all main environmental organizations in Russia to the Khimki battle. This means that it is also of global importance as the environmental movement in Russia and all supporting the call to protect nature as the antifascists have done several times are the main force behind protecting the ecosystem in one of the largest countries on earth. Their struggle is our struggle. Or as the succesful concert and manifestation in Moscow that caused the temporary halt to the construction of the high way through the forest was called: ”Khimki forest is everywhere”. 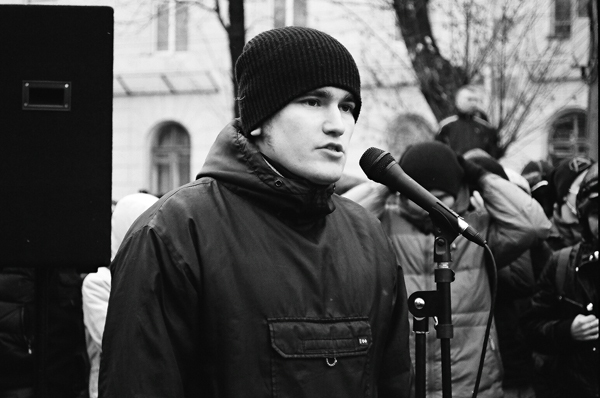 Join the calls for protecting the Khimki forest and the coming international action days 17-20th of September for Freedom for Alexei Gaskarov and Maxim Solopov and other antifascists. Below you find links to websites and articles about the conflict and the callout for international action to support Russian activists, and in the end the press release about the founding of the Coalition ”For the forest near Moscow”. The threat of destruction Khimki forests and forest-park zone in the whole of Moscow rallied the Russian environmental movement. 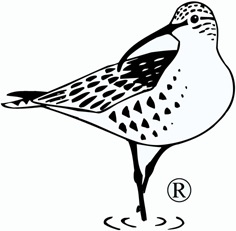 As of today, Russia’s largest non-governmental environmental organizations and associations – the Movement for Defense Khimki forests, Greenpeace Russia, WWF Russia Biodiversity Conservation Center, Russian Bird Conservation Union, Socio-Ecological Union – will act in an unified coalition “For the forest near Moscow. This is not the first time that the government’s actions that can cause irreparable damage to the nature of our country, inspire a rise in public environmental management, and ultimately lead to the consolidation and strengthening of the environmental community. For example, the diversion of the northern runoff of rivers in the southern regions of the USSR brought in the 80s of the last century, an unprecedented rise in public environmental movement, whose results are still being felt today. The scale of planned construction in the Khimki forest is much more modest than the once planned diversion of the runoff of northern rivers. But for the future of our nature conservation Khimki forests is no less important than the abandonment of the rotation of the rivers. Construction of trails through the Khimki forest – is not only the destruction of one of the most valuable forests in the forest-park zone of Moscow, but also an important precedent, the key to the destruction of the remaining parks. Selecting a route through the Khimki forest means that the constitutional right of citizens to a healthy environment, which is an essential function of the suburban parks, is denied, at least in comparison with the interests of owners and tenants of other plots. 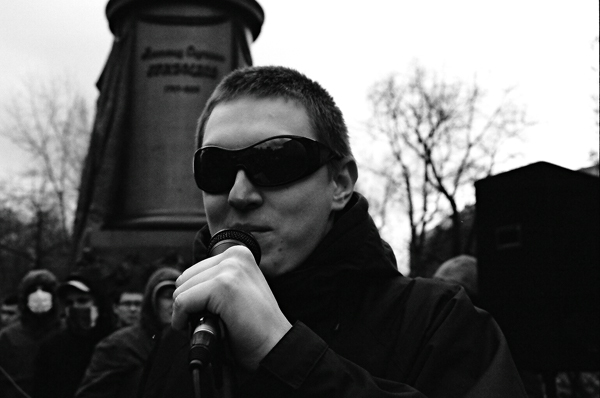 Furthermore – if the trail through the Khimki forest will be built, it is actually legitimizing the harassment of citizens protesting, attempted murder, criminal structures in the punitive system and provocations in order to protect the interests of economic and financial structures that implement large-scale commercial projects. The decision on laying tracks through the Khimki forest – is a huge step in the direction of the rule of law in the criminal totalitarian regime that denies basic rights of citizens of Russia. “The attention of the coalition” For the forest near Moscow, will focus on the protection of all forest land in the Moscow region, their ecological role of xtrme high importanc in a n area with very high population density. The preservation and restoration of forests outside Moscow should be the number one priority in regional policy in the decades ahead, because it is nature provide the population of the territory of oxygen and other necessary conditions for life, a lack of which the people living here are already experiencing “- said Alexey Zimenko, director general of the Biodiversity Conservation Center. Non-governmental environmental organizations and associations that make up the coalition For forests of Moscow region, Khimki intend to strive to maintain the forest, forest-park belt of Moscow and the whole reconstruction of careful and reasonable relationship to the forests of Moscow region. Is the leader of the peasant movement in Bangladesh with half a million members. Badrul Alam participated in the Climate justice protests at the COP15 in Copenhagen and have also earlier been active in the global justice movement protests at Summits. Bangladesh Krishok Federation is a member of Via Campesina international. Academician and activist, professor at the University of KwaZulu-Natal, where he has directed the Centre for Civil Society since 2004. His research interests include political economy, environment, social policy, and geopolitics. Have been working for the South African government, authoring or editing more than a dozen policy papers. He has been active in several movements for social justice, against privatization, and for climate justice. He is in the board of several international journals and has written many articles and books as South Africa and Global Apartheid – Continental and international policies and politics, Global uneven development, primitive accumulation and political-economic conflict in Africa: the return of the theory of imperialism, Post-imperialist north-south financial relations?, Against carbon trading as climate change mitigation, Ideology and strategies in the fight against multinational corporate water privatization, and Ideas and strategies in the alterglobalisation movements. Is trained as a lawyer and now living in London. He has been campaigning on issues of civil liberties, human rights, ecology and democracy. Mark Barrett was inspired by taking part in the anti-APEC and anti-MAI (Multilateral Agreement on Investments) nascent global justice movement. He organised the ‘People in Common’ picnic campaign, a direct action response to the clampdown on peaceful protest in Westminster which grow into the Campaign for a 21st Century Constitution. During the G20 protests in London Mark Barrett was a spokes person for the mobilizations. Following a conference on Human Rights to commemorate the 60th Anniversary of the Universal Declaration of Human Rights (UDHR), Mark and colleagues formed a new network: Project 2012 is dedicated to building a rights based coalition for a new society in the UK and elsewhere. At the same time, as part of his work for the 21st Century Network, the Campaign for Real Democracy (CRD) was set up, aiming at developing a new political economy, and social action based on ‘real’ (as in ‘decentralised’, ‘bottom up’) democracy. The idea is that an independent civil society is the third superpower, which must now stand up as an equal alongside, and ultimately as the master of both state and capital; and that need a new political economy, based on a radical localism, is needed in order to make that a reality. Is making direct cultural actions promoting climate justice. Art Not Oil has aimed to encourage artists – and would-be artists – to create work that explores the damage that companies like BP and Shell are doing to the planet, and the role art can play in counteracting that damage. It is designed in part to paint a truer portrait of an oil company than the caring image manufactured by ‘cultural activities’ of the oil multinationals which also happen to divert public attention away from their actual activities. Art Not Oil is a project of the climate justice movement Rising Tide UK. Local environmental activists in the Michoachan region in Mexico, one of million local environmentalists around the world struggling in similar conflicts as Ecodefence is doing in Moscow. Nicola Bullard is a Senior Associate with Focus on the Global South and active in the Climate Justice Now! (CJN!) network. Focus on the Global South is based in Thailand and involved in issues as global economy, peace, democracy and building movement alliances. Climate Justice Now! network brings together international mass movements as Via Campesina, Friends of the Earth International and Jubilee South. Nicola Bullard joined Focus in February 1997. Before that, she worked in Cambodia, Thailand and Australia with human rights, development, and women’s organisations and with trade unions. She has also worked as an editor, journalist and publisher. Nicola studied international relations at the Institute for Social Studies in the Hague, and education, geography and urban sociology in Melbourne. She is Australian. Chair of Friends of the Earth Sweden, active in numerous campaigns such as against monoculture in forestry and the Swedish-Finnish corporation Stora Enso exploitation of small farmer lands in Latin America, climate justice, transportation and at the moment in building alliances between environmental and peasant movements in Sweden. Has been an activist in Rain Forest Action and at the moment in Ruckus society. He is working to bridge movements for environmental sanity and racial justice. He is a strategy and non-violent direct action trainer with the Ruckus Society, and serves communities impacted by fossil fuel extraction. He works internationally with the Climate Justice Now! network to bring justice to the United Nations Framework Convention on Climate Change and has been a leading voice in the International Youth Climate Movement. During the Climate Summit in Copenhagen he started the walk out by NGOs and some members of governmental delegations from the official conference during the Reclaim Power action. In early 2006, Josh was a core organizer in reviving, launching and building the “new” Students for a Democratic Society (SDS), a national multi-issue youth & student led group, which grew rapidly to over 250 chapters and nearly 3,000 members nationwide. He graduated in 2006 with degrees in Women’s & Gender Studies and Sociology. At Brandeis he coordinated successful university-wide student strikes with the Brandeis Anti-war Coalition in March of 2003 to protest the invasion of Iraq, and again in May of 2006 on May Day in support of Immigrant Rights. Josh Kahn Russell is a member of Bay Rising Affinity Group, and works with Mobilization for Climate Justice West. He currently lives in Oakland, CA. Is an international activist and coordinator of ecological agriculture and food sovereignty in one of the most influential ecological movements in Europe. Ecologistas en Accion was one of the main forces in building the global justice movement in Europe by initiating and being part of large system-critical alliances opposing the neo-liberal agenda at the World Energy Summit 1992, The 50th anniversary of the Bretton Woods institutions IMF and the World Bank 1994 and the EU Summit 1995, all in Madrid. Tom Kucharz have recently been active in the campaign against a Europe of Capital and member of the organizing committee of People’s Summit Enlazando Alternativas IV, during the EU-Latin America Summit in Madrid this year. Have been working with CACIM – India Institute for Critical Action: Centre In Movement and recently joined the mass movement NAPM which was initiated by the Narmada movement. The Narmada movement to prevent the forced eviction of hundreds of thousands of people due to the construction of dams turned mass civil disobedience into a main model for struggle in the global environmental movement in the end of the 1980s and is still today a key movement for another development in India and a symbol for resistance against the present development model world wide. Rising Tide in Mexico, a Climate Justice direct action group at the moment involved in organizing protests during the COP16 Climate summit in Cancun. Local environmental activists in the Mexico city region struggling against motorways and other issues of environmental concern as the being against the neoliberal development model. Initiators of the Klimaforum10 process in Mexico towards the Climate Summit COP16 in Cancun late this year. Spokes person for Climate Justice Action during the Climate Summit in Copenhagen December 2009. She is accused of charges including planning violence against police, systematic vandalism and serious disturbance of public peace and order. Some of these charges are drawn from the Danish terror package and the penalties are strengthened by the new Danish anti-protester laws introduced just prior to the COP15. The charges they face are unfounded, but can still potentially result in years in prison. Tannie Nyböe was in the demonstration van during the Reclaim Power action coming from outside. At present facing trial in October in Copenhagen. Two other spokes persons for Climate Justice Action faced the same charges as and got their verdict late August. They were found not guilty on all charges. Tannie Nyböe is active in the Climate Collective, a key organization in the Climate Justice Action. Is an activist in the Vasudhaiva Kutumbakam international network for comprehensive democracy being involved in the World Social Forum and the South Asian Dialogue on Ecological Democracy. Is a flower growing peasant from the Bordeaux district in France. She has been representing Via Campesina internationally in the World Social Forum process and in the civil disobedience actions at the Climate Summit in Copenhagen. Via Campesina is a mass movement for small farmers with some 200 million members world wide and a strong force in uniting people’s movement for social and environmental justice and against repression. Josie Riffaud is a member of the national board of Confédération paysanne, a Via Campesina organisation in France. Green party politician and active in Friends of the Earth Finland. Active in numerous campaigns as against the Swedish-Finnish corporation Stora Enso exploitation in Latin America. Have been writing on sustainable consumption globally and the need to see the class dimension in the environmental struggle. Participated on behalf of Friends of the Earth Finland at the founding meeting of People’s Global Action against “Free Trade” and WTO in Geneva 1998 and is presently active on local issuesn, in the Degrowth movement and with Vasudhaiva Kutumbakam. Social Democratic politician and head of the department of philosophy at the university of Helsinki. Veteran in the movement for international solidarity and environmental concerns. Democracy Forum Vasudhaiva Kutumbakam is a long term cooperation to strengthen the idea of comprehensive democracy on all fields of human life inspired by yearly exchange of activists between Finland and India since 1989 on development critique and democratization of society. 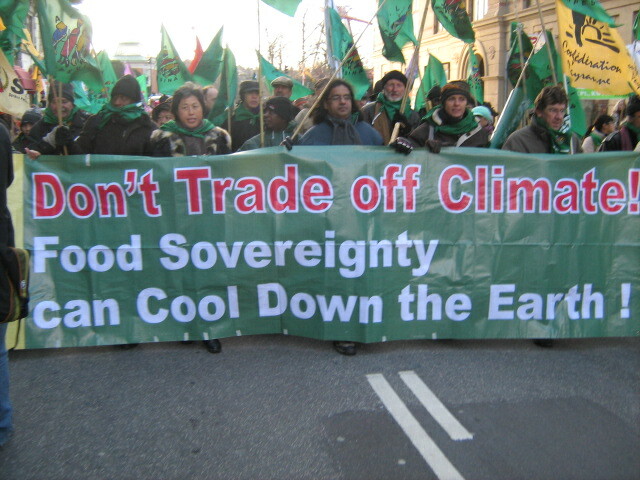 Organized successful antirepression work in Helsinki during an EU-Asia Summit in 2006.